I increased the size of each space but the rules are the exact same as in the original problems published by Bongard. I'm adding a link in case people aren't familiar with this type of riddles Click me! 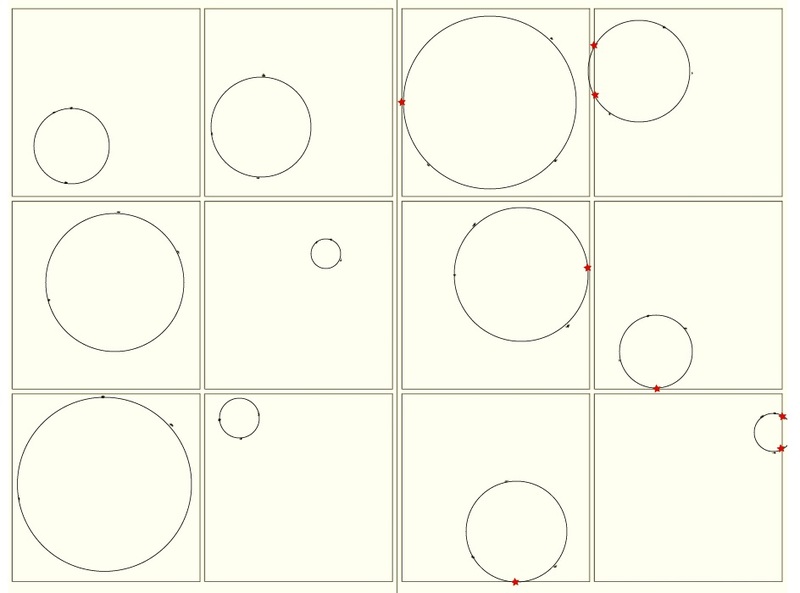 The circles defined by the three points in each box are totally inside the boxes (on the left), but intersect with the boxes (on the right). 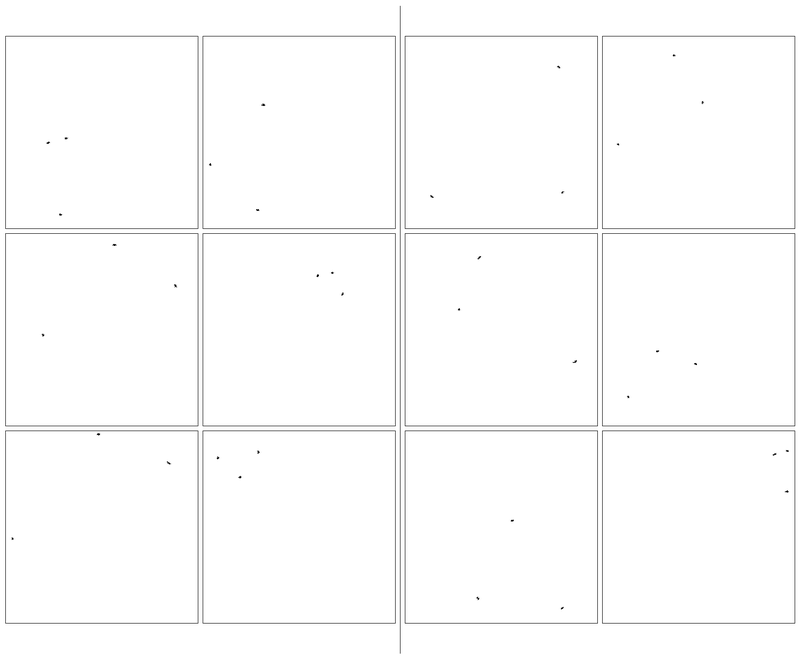 If you treat each cell as starting conditions for Conway's game of life, then several familiar patterns form (familiar to me from the few GOL I have seen). The ones on the left all decay down to patterns that do not traverse the screen. Left to right, top to bottom, L1 and L2 decay to 2x2 squares, L3 decays to a 2x2 square and an alternating - and |, L4 decays to a group of 2x2 squares and an alternating - and |, L5 decays to two small ovals, and L6 decays to a single oval. R1 decays to three ovals, a square, and 6 alternators. R2 decays to a group of squares, ovals, and alternators. R3 decays to a square. R4 decays to a square and 4 alternators. R5 decays to an oval and 4 alternators. R6 forms what I believe is a diagonal spaceship and decays to a square at edge of screen. Of these, with the exception of L4, the left side decays faster to simpler patterns than most of the ones on the right. The only LR differing pattern I can see is that at least one of the remnants on the left remains over an original position, where as that does not seem to be a requirement for the right. In the end I do not think I know enough about life to identify deeper patterns. I guess my implementation could be incorrect as well. It certainly was not efficient, heh. Not the answer you're looking for? Browse other questions tagged logical-deduction pattern visual bongard or ask your own question.